Jacob, like his grandfather Abraham, is a central character in the history of the people of Israel. So central, in fact, that the Israelites derive their very name from Jacob, but I’ll get to that latter. Jacob fathers one daughter and twelve sons, these sons later becoming the twelve tribes of Israel. One of his sons was Joseph, the Joseph of multi colored coat game, but his story comes later. While not the first story about Jacob, that would be his birth in chapter 25, this is one of the most well known. The story takes place in chapter 28 of Genesis, and involves what is probably the most famous ladder in history. 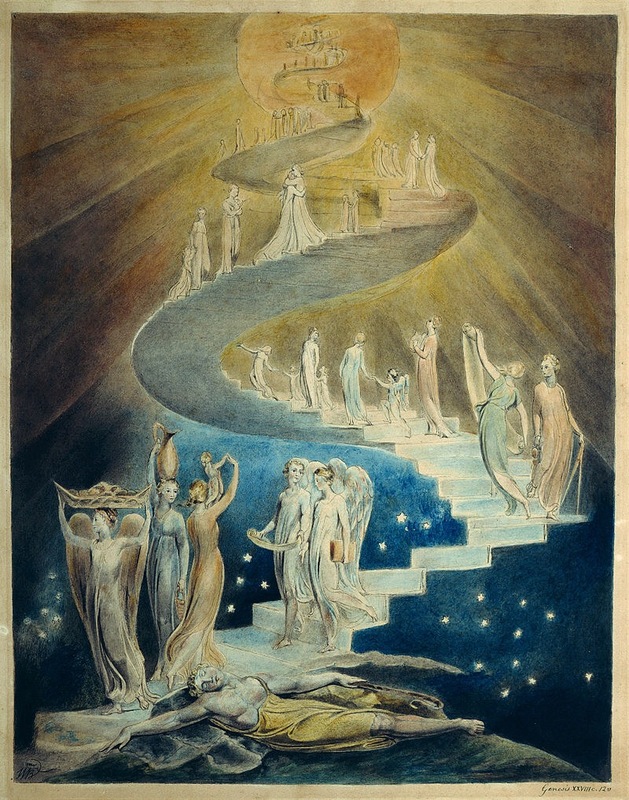 Jacob dreams of a ladder, or staircase, connecting heaven and earth. And by using this ladder, angels of the Lord come and go to do His will on earth. This can be seen as a prophecy of Christ talking on our humanity (John 1:14) and becoming like us in all things but sin (Heb 4:15), therefore uniting heaven and earth and bridging the divide between the two. By sending His Son, God gave us the perfect mediator (1 Tim 2:5) between heaven and earth and fulfilling the dream that Jesus’ ancestor had at Beth’El. In the dream, God appeared to Jacob, and reaffirms the covenant that He made with Abraham and Isaac. He promises to give the land to Jacob and his descendants,to multitude of descendants, and that all the earth will be blessed by his descendants. After the death of Abraham, in Genesis 25, Isaac and Rebekah have twin sons. Jacob, who is the younger twin, comes out of the womb holding on to the heel of his older brother Esau. This was an indication of things to come. God even told Rebekah that there would be strife with between her two sons. As they grew up, Isaac favored Esau and Rebekah favored Jacob. It doesn’t say so in the Bible, but when Jacob deceives his brother, it seems to be premeditated and possible assisted by Rebekah (just my opinion). Once when Jacob was boiling pottage, Esau came in from the field, and he was famished. And Esau said to Jacob, “Let me eat some of that red pottage, for I am famished!” (Therefore his name was called E’dom.) Jacob said, “First sell me your birthright.” Esau said, “I am about to die; of what use is a birthright to me?” Jacob said, “Swear to me first.”So he swore to him, and sold his birthright to Jacob. Then Jacob gave Esau bread and pottage of lentils, and he ate and drank, and rose and went his way. Thus Esau despised his birthright. Seems like Esau didn’t even understand how much he was giving up for a bowl of lentils. Had he known, I’m pretty sure he would’ve held out for a better deal. Either that or he was the worlds worst negotiator. This was phase one of the deception, even though Esau sold his birthright, that didn’t mean Isaac was going to go along with it. Phase two came when it was time for Isaac to give his blessings to his sons, just before he died. In verse one, we read that Isaac is blind and almost dead, so now seems like the perfect time to finalize the stealing of Esau’s birthright and blessing. If there was any doubt about Rebekah’s involvement before, that doubt is now erased. She comes up with the plan to supplant her one son with the other, maybe she was innocent in the first phase but she seems like the instigator of the second phase. When Esau actually comes home, both him and Isaac are not happy about what has happened, to put it mildly. Esau plans on killing his brother as soon as his father dies, and Rebekah hears of this so she urges Jacob to flee to her brother. In between Jacob’s trickery with Esau and his arrival at Haran was the dream and ladder in Beth’El. After leaving Beth’El, he arrives at Haran. But Jacob was either unaware of, or didn’t care, that you reap what you sow. So Jacob goes to his uncle Laban, and there he falls in love with his youngest daughter, Rachel. In hindsight, Jacob probably should’ve seen it coming, after what he had done to his brother, but there he was in Haran for seven years and then the rug gets pulled out from under him. So Laban gathered together all the men of the place, and made a feast. But in the evening he took his daughter Leah and brought her to Jacob; and he went in to her. (Laban gave his maid Zilpah to his daughter Leah to be her maid.) And in the morning, behold, it was Leah; and Jacob said to Laban, “What is this you have done to me? Did I not serve with you for Rachel? Why then have you deceived me?” Laban said, “It is not so done in our country, to give the younger before the first-born. Complete the week of this one, and we will give you the other also in return for serving me another seven years.” Jacob did so, and completed her week; then Laban gave him his daughter Rachel to wife. (Laban gave his maid Bilhah to his daughter Rachel to be her maid.) So Jacob went in to Rachel also, and he loved Rachel more than Leah, and served Laban for another seven years. It was customary for a bride to remain veiled on the wedding night and inside the tent was dark, so that Jacob was blind to the rise until the morning light. This echoes how he took advantage of his father’s blindness in stealing his brother’s blessing. Laban failed to mention, over the course of seven years, that it was customary for the eldest daughter to be married first, this too echoes Jacob and Esau, except in this instance it is the elder supplanting the junior. Jacob learned the hard way that we should alway live the golden rule. Jesus summed it up twice in the Gospels, and in the Matthew quote, He goes as far as to say that this is a summation of the law and the prophets; in essence it is the sum total of the moral law. I’m sure Jacob wished he had been treated fairly by his uncle, but he had been unfair to his own brother. He had deceived his brother and his father, and in doing so he set himself up to reap what he had sown. and that to you, O Lord, belongs steadfast love.For you repay a manaccording to his work. Do not be deceived; God is not mocked, for whatever a man sows, that he will also reap. For he who sows to his own flesh will from the flesh reap corruption; but he who sows to the Spirit will from the Spirit reap eternal life. And let us not grow weary in well-doing, for in due season we shall reap, if we do not lose heart. So then, as we have opportunity, let us do good to all men, and especially to those who are of the household of faith. But as careful as we should be in our dealings with others, it shouldn’t be just for fear of divine payback. We should be fair with all we deal with because that is the way of the Gospel. Remember that Christ didn’t say “don’t do what you don’t want done to you,” He said “Do unto others…” It’s a positive command to be fair and upright in all our dealings. Jesus touched on this in His calling of Nathanael. He told Nathanael, “behold, an Israelite indeed, in whom there is no guile.” (John 1:47) Considering that Israelites get there name from Jacob (who later has his name changed to Israel), it seems like Jesus was making a point here that Nathanael wasn’t beguiling like his ancestor Jacob, that just because our forefathers behaved a certain way doesn’t give us license to do so as well. After being hoodwinked by his uncle, and spending an extra six years tending his flocks, Jacob catches wind that he’s worn out his welcome so he packs his things and leaves in the middle of the night. Laban catches up to him ( and was rebuked by God for being angry with Jacob) and there is an airing of grievances. After This episode they make a peace treaty and go their seperate ways (Genesis 31). Now Jacob has to deal with another problem; as he is traveling back to his homeland, he is told that his brother is coming and with an army. Considering that they parted on less than friendly terms Jacob is frightened by this news and pleads with God for deliverance. In his prayer, he remembers the promises of God that were made during his dream at Beth’El. Jacob has grown, in his 20 years across the Jordan. He recognizes that all he has comes from God, and his very life is on God’s hands. He is a much different person than the young man that deceived his father, and fled his older brother. He is afraid, but he trusts in God for deliverance, just like we should when we face our own trials. So Jacob sends many gifts to his brother, and calls him his lord and says of himself that he is Esau’s servant. Then he sends his wives and children across the stream at Jabbok, while he spends the night alone on the other side. This is one of the most mysterious stories on the entire Bible. Here the text says “a man” and even reading the Hebrew word here doesn’t shine anymore light on his identity. By saying “a man” it seems like the author is saying that it wasn’t another dream, or a vision, or some kind of spirit, but that it was a truly physical being. Whoever, or whatever, this “man” was, he changed Jacob’s name to Israel. Like many of the biblical name changes, this signifies a shift from the deceitful young man to the faithful man who grapples with God and morality. This new name means “he who strives (struggles) with God”, meaning this may have been God that Jacob was wrestling, or that he struggled with serving God. Jacob seems to think it was God Himself, as evidenced by his comment in verse 30. Hosea 12:4 identifies the “man” as an angel of God. Some people have also identified the man as a pre-Incarnate Christ, along the lines of theories about Malchezidek (Genesis14) and the fourth man in the fire (Daniel 3:25). CCC 2573 God renews his promise to Jacob, the ancestor of the twelve tribes of Israel. 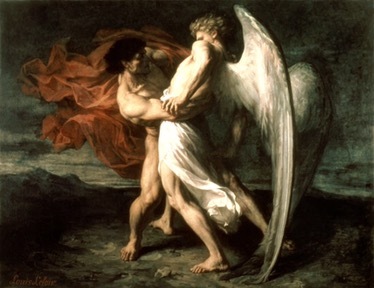 Before confronting his elder brother Esau, Jacob wrestles all night with a mysterious figure who refuses to reveal his name, but he blesses him before leaving him at dawn. From this account, the spiritual tradition of the Church has retained the symbol of prayer as a battle of faith and as the triumph of perseverance. I like St Ambrose’s reading of this story, that Jacob was wrestling with God and struggling to attain virtue. We should all grapple with God and His law, and fight our inclinations to sin. Just like all the other stories in the Old Testament, there is a moral here that can be applied to our lives today. If I were to take anything from this wrestling match its this; get on the mat and engage with God, He is not some far off deity that watches from a distance like the god of Deism, He is a God that engages with humanity. His engagement with us went so far as to take on human flesh and die for us. Don’t ever forget that. Looking at these three events in Jacob’s life, I see three main things to takeaway from it. God had a plan for Jacob’s life, just as he has a plan for our lives. Live the golden rule. Not just because we reap what we sow, but because we are called to love our neighbor as ourselves. Just like Jacob wouldn’t let go, we need to persevere in prayer and in faith. We need to struggle and grapple with concupiscence to attain the virtue and holiness that God desires for us. This entry was posted in All Posts/Archive, Catholic Life, Story of Salvation, Uncategorized. Tagged catholic, Catholicism, christianity, jacob.